WILL she or won’t she? Even as Karishma: The Miracle of Destiny goes on air on Sahara Manoranjan, Monday to Friday, 9.30 p.m., speculations are rife whether Karishma Kapoor can pull off one of the biggest and most expensive wagers of the small screen. After emerging victorious from a real-life messy courtroom drama, the long-awaited serial has finally entered viewer’s living rooms. Though it may be too early to say, the question is: Can Karishma do for Sahara what Kyunki Saas Bhi Kabhi Bahu Thi did for Star Plus? Even as British author Barbara Bradford had taken Karishma to court on charges of plagiarism, the producers were going ahead with the shooting of the serial that is reported to be paying Karishma Rs 1 crore a month. A few weeks ago, it was extensively shot in Dubai. In March, there was an 11-day shooting stint in New Zealand and in August, the unit is preparing to leave for Spain for another spell of overseas shooting of the serial that revolves around Karisma, whose character goes through a dramatic transition in a story that spans over five decades. With a star cast comprising Bollywood discards like Arshad Warsi, Arbaaz Khan, Jugal Hansraj, Sanjay Kapoor and Vikas Bhalla, viewers are hotly debating whether Karisma would be able to rewrite her own destiny in films the way Bachchan did with KBC. 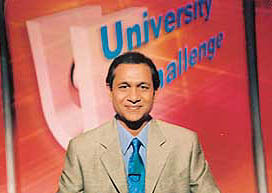 After five successful series of Mastermind India and almost a decade and half since his famous Quiz Time, India’s favourite quizmaster Siddhartha Basu is hosting yet another show titled University Challenge on BBC World every Thursday at 10 p.m.
Based on one of the longest ever-running quiz shows, it has the brightest Indian quizzers engaged in a war of minds. The 32-episode series will have the best quizzing teams from top Indian universities and colleges battling it out for the prestigious trophy. In the first four episodes the winning teams from the University of Edinburg, Queens University, University of London and University of Wales will challenge Indian teams comprising IIT Chennai, R.V. College of Engineering, Bangalore, Javadpur University, Kolkata, and S.P. College of Engineering, Mumbai. "It’s more youthful and energetic than Mastermind India. It will be one of the brainiest shows ever on Indian TV," says Basu. The icing on the cake will be the grand finale where Indian winners will take on the UK winners. Which in a small way would settle a long debated issue — that the Indian brain is as good or even better than the best in the world. 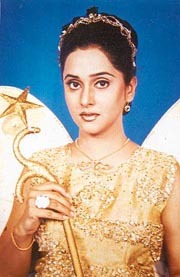 Critics instantly wrote her off when she stepped into the glamworld riding in a non-glamorous film like Maa Santoshi Maa. Expectedly, the film sank without a trace and so should have the career of its leading lady. But no, Jyoti Mukherjee has no reasons to regret having done the film. Ever since then, this fashion designer-turned actress is being inundated with TV offers. 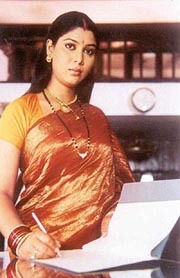 Even as she was planning to quit films after Maa Santoshi Maa, director Anurag Basu offered her the lead role in his serial Manzilen Apni Apni. After the author-backed role of Shruti in Manzilen... there’s been no looking back. She’s since done lead roles in Gharana and is currently doing Kittie Party where she plays Ritika and Mulk in which she does the role of CBI officer Asha. Jyoti is now busy producing and starring in Pratima, a serial based on a Bengali novel by Tara Chand Bandopadhya to be aired on Sahara Manoranjan. Once that is complete she has plans for two more serials. Says Jyoti, "That’s more than I can handle. I don’t think I’ll take on more project." Not bad going for a lady who a year ago was content at being a little known fashion designer. All you channel surfers who thought that in the era of Harry Potter and Matrix kids are no longer interested in granny’s fairy tales are in for a surprise. Sonpari aired on Star Plus every Sunday at 7 p.m. and based on popular Indian fairy tales has completed a marathon 130 episodes and the Pari played by the versatile Mrinal Kulkarni has bagged the Best Jadui Kirdar at the Star Parivar awards. "The award has a special place in my heart as it shows the love and affection kids have showered on me," says Mrinal aka Sonpari. As proof of her popularity, she shows loads of letters that she gets from children daily, cheering her for regaining her magical powers that she had lost for some time. With her wizardry revived, Sonpari is back to protecting little Frooti against all the evils of the world and bringing a smile not just on the face of the young girl but also on the faces of millions of her fans. It is little wonder that producer Neena Gupta too has been smiling all the way to the bank. Though the Ajay Devgan-produced and Anant Mahadevan-directed Devi every Friday at 9 p.m. on Sony Entertainment Television has the trappings of a soap, its popularity has not peaked despite it being turned into a murder mystery with a touch of the supernatural. Even as it completes a year on TV, the ambitious Devgan project is in danger of going the way of his two films Hindustan Ki Kasam and Raju Chacha. It hasn’t lived up to the promise it held out in the initial episodes even with seasoned stars like Sakshi Tanwar and Mohnish Behl. The culprit here seems to be a loose script which is repetitive and melodramatic. The serial could urgently do with some fast-paced sequences, a more punchy script and certainly the divine Devi’s intervention. Now, in a bid to put energy into the serial the makers are organising special appearances in different cities. The first halt was Chandigarh on July 23, where Sakshi Tanwar interacted with the viewers and spoke of her role in the serial. Going by the enthusiastic response she received it appears that Devi may finally bless Devgan. After the successful Super Selector South Africa 2003, it’s time now to move on to England on ESPN Star Sports. So all you sports buffs who participated in the Britain Sportzyatra can keep your fingers crossed, as you might be the ones to win tickets for two to a fully paid trip to some of the most prestigious sporting venues in England. The nationwide contest Britain Sportzyatra revolved around four spectacular sporting events — Wimbledon, Natwest Series, Formula-1 race at Silverstone and the FA Premier League Asia Cup. The questions have been asked and for those who exercised their brains the wait is almost over. Lucky winners like Delhi’s Vikram Singh have got a dream trip of a grand tour of Wimbeldon, the Lord’s, Manchester United Football Club and finally to the fast lanes of Silverstone circuit. For others the wait has just begun even as the channel’s team goes from city to city throughout August selecting nine more lucky winners who will get a once-in-a-lifetime visit to these exciting sporting venues.